I came to go hiking in the mountains of Norway almost by accident, little did I know the wonderful walking experiences that I was to find. Rugged mountains, beautiful lakes, long long days and a very big sky are my enduring memory of Norway. 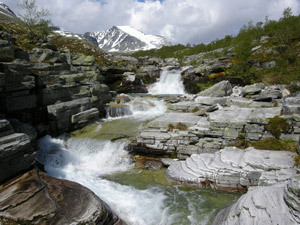 See descriptions of three mountain areas, the Rondane, Jotunheimen and Trollheimen. All have a different character and offer a uniquely Norwegian experience. Mountain Huts In Europe - What are they like? 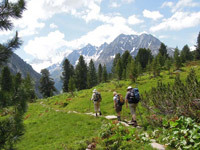 Hiking in the European Alps is a unique experience and the reason for this is directly due to the mountain hut system that straddles the alpine countries and is so much part of the European walking culture. What are these huts like? Find out here. 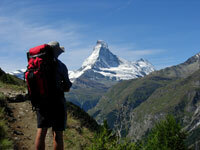 The Tour of Mont Blanc is a magnificent and extremely popular 11 day walking circuit of the Mont Blanc Massif. And that is just the problem - it is so popular that huts are crowded and the walking experience is diluted. Why you should go walking in Austria? 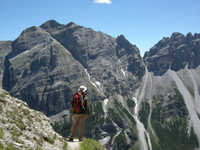 In mid 2006 Bogong owner Neil and his son Tim enjoyed an extraordinary journey across the spine of the European Alps. Starting on the sea in Trieste, Italy, their journey crossed five countries and many mountain passes to arrive back at the Mediterranean Sea in France at Menton 97 days later and both about 14 kilos lighter.